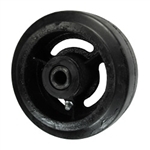 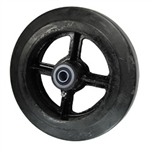 Choose Mold on rubber wheels for an easy rolling, shock absorbing, quiet operation. 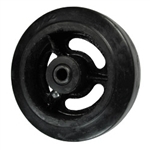 Cushioned rubber tread vulcanized to cast iron center offers excellent floor and load protection. Rubber on cast iron wheels have a Durometer measurement of 70-80 Shore A. 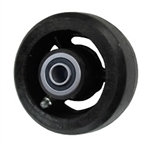 Our online store listings feature roller bearings. If you need a different option for wheel bearings or another variation of wheel not listed, please call our on location sales staff at 1-800-215-8220.